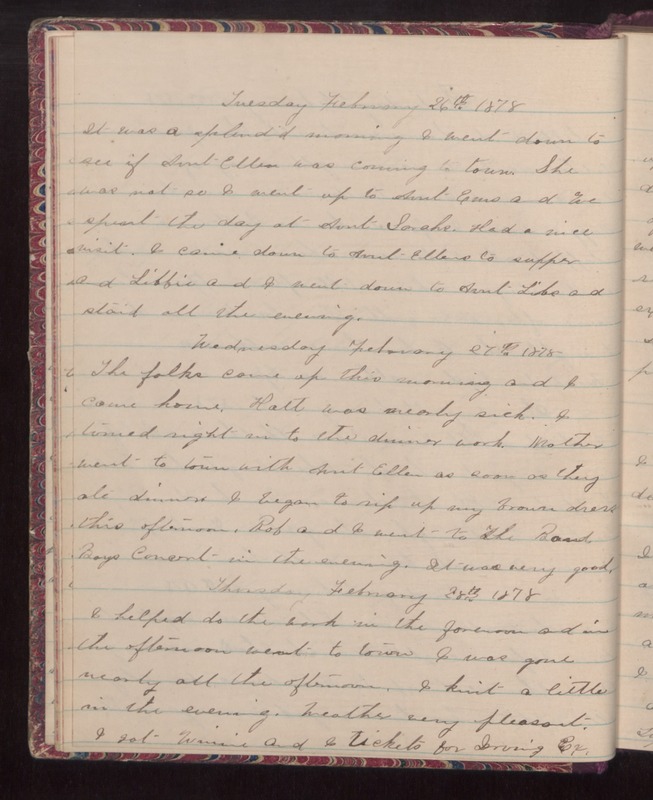 Tuesday February 26th, 1878 It was a splendid morning I went down to see if Aunt Ellen was coming to town. She was not so I went up to Aunt Ems and we spent the day at Aunt Sarahs. Had a nice visit. I came down to Aunt Ellens to supper and Libbie and I went down to Aunt Libs and staid all the evening. Wednesday February 27th 1828 The folks came up this morning and I came home. Hatt was nearly sick. I turned right in to the dinner work. Mother went to town with Aunt Ellen as soon as they ate dinner. I began to rip up my brown dress this afternoon. Rob and I went to The Band Boys Concert in the evening. It was very good. Thursday February 28th, 1878 I helped do the work in the forenoon and in the afternoon went to town I was gone nearly all the afternoon. I knit a little in the evening. Weather very pleasant. I got Winnie and I tickets for Irving Ex.